My apologies for the late notice, but I do want to spread the news that issue number 21 of Le Visage Vert came out late last year. As always, it's a beautiful production. Writers represented range from the older John Bedoit (1829-1870), Lafcadio Hearn (1850-1904), Marcel Schwob (1867-1905), Richard Marsh (1857-1915), and Bodo Wildberg (1862-1942), to the contemporary Nicholas Royle (b. 1963). The Hearn story is from Kwaidan. The Schwob story is from The King in the Golden Mask. Richard Marsh's tale, "The Mask", includes illustrations from its appearance in The Gentleman's Magazine, December 1892 (the story was later collected in Marvels and Mysteries). 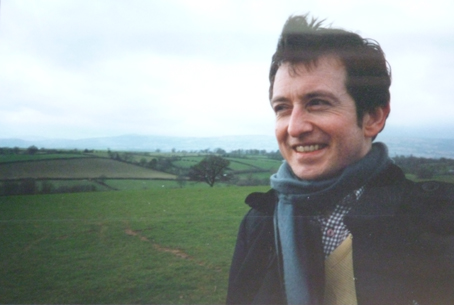 Nicholas Royle's story, "The Lure", is translated from it's appearance in The End of the Line: An Anthology of Underground Horror (2010), edited by Jonathan Oliver. 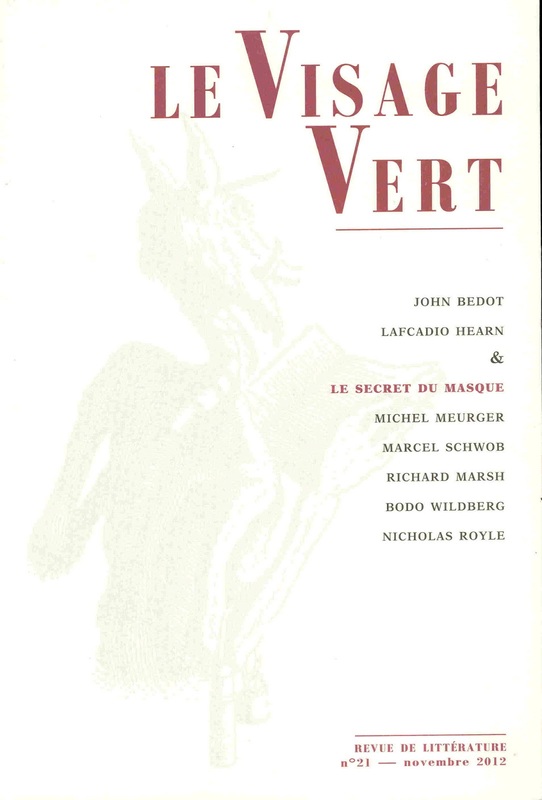 Michel Meurger contributes a long essay "Le Secret du masque", setting up the major theme for the issue. 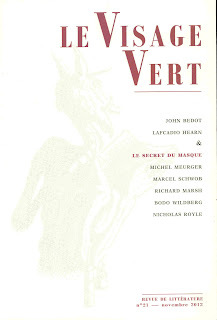 To order, visit this website and scroll down to find the issues of Le Visage Vert. Recommended. Further to the post below, Rex Ryan's granddaughter, Elspeth Caton, discovered the following fascinating newspaper article, probably from the Fleetwood Chronicle. The date is uncertain, but judging from the evidence of other articles in the clipping, it appears to date to about May 1926. The relevant section of the article reads: "Next week the company [The Fleetwood Palace Stock Co.] will present "David Garrick." The rare comedy of this famous play should endear it to every patron of "Our home of drama." The production will witness the return to Fleetwood of Rex Ryan, who will be remembered as a member of last year's dramatic company. Mr Ryan will be the David Garrick, as well as the producer of the play. He has had a unique experience in repertory of every kind, including all Shakespeare's plays. He is himself an author, not only of many successful plays, but of two or three novels of which the best known is "The Tyranny of Virtue," a best-seller in Australia and by no means unknown in this country." So it appears there are still a couple of Rex Ryan novels to be found. Kudos to the first person to discover these books! A note of caution, though - I'm not sure that The Tyranny of Virtue was a bestseller in Australia - there are only two references to it in the NLA's digitised Australian newspapers - for the copies sent to The Sydney Morning Herald and the Melbourne Argus. And no copy exists at any library in the UK, which might suggest it is unknown in this country! A useful resource I wasn't aware of until today is The Stage Archive, with searchable digitised images of the long running theatrical advertiser, The Stage Directory. Unfortunately it's not free to use, and the search engine isn't necessarily accurate in picking up names, however there is a wealth of material including some references to Rex Ryan, better known as the cult 1930s thriller writer, R.R. Ryan. Using the Stage Archive it is possible to trace the activities of Ryan and his wife, Anne, who used the stage name Pauline Duke. The first reference I could track was an advertisement dated 29 October 1925: "Wanted to let, unproduced farce, small cast, simple scenery. One big scream. Suit St. Char. Com. - Ryan, 78, Clarendon Rd, C.-on-M., Manchester." Unexpectedly disengaged and looking for work. Perhaps to save a few pennies they refer to themselves as R.R. and P.D. A similar advertisement with the same address appears in the next issue, dated 12 November 1925. The next reference is dated 8 July 1926 and refers to a play of Mary Roberts Rinehart's, The Bat, put on by Stephen C. Venner's Venner Repertory Co. at the Rotherham Repertory. According to the reviewer "The audience liked, too, the acting of Mr Rex Ryan as Dr Wells." On 2 December 1926 at the same venue, the Venner Repertory Co opened with "If Winter Comes" and Rex Ryan was one of the principals. On 8 December 1927 the Imperial Players presented "Lady Windermere's Fan" at the Royal at Castleford (which was managed by Ryan's former colleague at Venner's Repertory Co, Rex R. Stewart), with Rex Ryan playing Lord Windermere. The review says that "The Mad Doctor" will be presented tonight." One week later the Imperial Players presented "Ashes of Virtue" at the Royal. The reviewer notes that "Rex Ryan gave an excellent characterisation of the Jew," and goes on to say that "Pauline Duke was charming as Peace Meredith." The review goes on to say that "The Black Triangle" will be presented during the week. On 22 December, also at the Royal, the Imperial Players put on "The Mystery of Mrs Drew," with Pauline Duke in the title role. Early in 1928 the Imperial Players are at the Royal in Worthing, near Brighton, where Ryan seems to have been manager. He advertises for players in April, with rehearsals on 24 April. The address for prospective players is Manager, 28 Grafton Rd, Worthing. On 12 July 1928 the Imperial Players presented "The Volga Boatman" at the Royal and Empire in Peterborough, with Rex Ryan as the Boatman and Pauline Duke as Princess Paula. On 19 July they played at the Alexandra in Pontefract, with Ryan giving "an excellent representation of Carol, the boatman," and Pauline Duke playing Princess Paula "with dignity." On 9 August they were at the Kidderminster Opera House and on 30 August at the Royal at Bilston. On 4 October 1928 they are advertising for players again, this time the contact is DUKE, 3 Willow Cottages, West St, Brighton. This was the address of Zoe Elsworthy (ie Mrs Adderley Howard), the mother of Pauline Duke (ie Anne Ryan), who passed away at that address on 18 March 1936. However, on 2 May 1929 the follow advertisement appeared: "Wanted to sell. All the successes of the recently disbanded Imperial Players. 'The Volga Boatman.' Refer Barnsley, Worthing, Percy B. Broadhead, Bognor, Peterborough, Lincoln, Doncaster, Rugby, Lidderminster, W.H. Glaze, Scunthorpe, S.C. Venner etc etc. An entire repertoire of real money-makers for a song: 'The Black Triangle,' 'A Cry in the Night,' 'The Demon,' 'Ashes of Virtue,' 'Mystery of Two-Gun Jules,' 'The Trap,' 'The Capital Change." Anyone interested is asked to write to the AUTHOR, 96 Victoria St., Fleetwood, Lancashire. The review goes on to say that "Mr Atholl-Douglas gave a fine impersonation of the Mandarin Wong Koo, observing throughout an impressive restraint. Mr J. Templar Ellis supplied a contrast with a telling embodiment of the frenzied Pearson, whose distraught state was graphically portrayed. Miss Maureen O'Mara sounded the emotional note with skill and judgment as Miriam, and Mr Noel Mackintosh supplied acceptable comic relief to the tension by his good-humoured rendering of the role of Dr James. Mr R. Clifford Holmes convincingly indicated the subtlety of Yen Ling with whom Miss Lesley Deane as Grace Lewis played her scene admirably. Miss Lily Adeson was a capital San Ming Lee, and Mr Harold Baker did well as the porter. The piece is crude, but its sensational theme and exciting situations invest it with appeal as an attraction for popular audiences. It had an unmistakably hearty reception." Again, the contact address is Zoe Elsworthy's. He must have had some success because The Burnley Times of 24 June 1931 advertises The Mandarin Wong Koo "by Rex Ryan", which is being staged at the Victoria Theatre by the Julian and Ward Players. In 1930 Rex Ryan and Pauline Duke were in Ireland. On 12 June the Empire Players present "Heart of a Thief" at the Empire in Belfast with Rex Ryan and Pauline Duke acting in it. On 17 July the Empire Stock Company presents "Ignorance" at the same venue. According to the reviewer, "Rex Ryan as the Rev. Frank Hastings is natural in all he does," and "Pauline Duke is a restrained and finished Mary Martin." In 19 June the pair were performing in "Under Two Flags," the popular Harry Collingwood novel; on 31 July, "Beggers on Horseback," on 14 August, "A Sinner in Paradise," and on 4 September, "When the Man is Away." By 13 November 1930 they are in Liverpool advertising for once again for work: "Pauline Duke and Rex Ryan. Dis. Leads. General Manmgt. 165, Islington, Liverpool." From this point I haven't found Rex Ryan mentioned in The Stage, though there may well be references I've missed. Presumably Rex and Anne settled in Brighton and Rex started writing novels. It's also worth noting a reference on 20 September 1928 to a play called "Stone the Woman!" The reviewer calls it "a strong, outspoken play based on the novel, "Tyranny of Virtue" by Noel Despard. A good house on Monday greeted the play with enthusiasm." Rex Ryan is known to have written "Tyranny of Virtue" under the name Noel Despard. The British Newspaper Archive has a couple of references to "Stone the Woman!" - the Derby Daily Telegraph of 11 August 1926 says "Mr Alfred Denville has secured the rights to "Stone the Woman!" 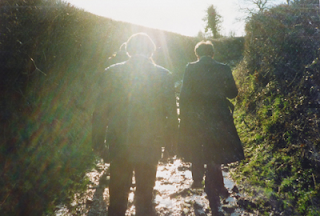 by Noel Despard from Mr Leonard Harrison who produced and toured the piece. Mr Harrison, I believe is part author of the play in addition." It is worth noting that Harrison ran a repertory company with Stephen C. Venner from 1924 to January 1925 - as we have seen, in 1926 Rex Ryan was one of the principals in Venner's repertory company. There is also an advertisement for the play, showing at the Grand Theatre, Plymouth, in The Western Morning and Mercury dated 14 April 1927, "by Noel Despard, author of the daring novel The Tyranny of Virtue." Rain Instruments is a book of found poems created by Mark Valentine from an Edwardian weather survey (British Rainfall 1910), recalling a lost time of country house amateurs in whimsical pursuit of a typically British preoccupation: rain measurement. Here is a selection of poignant, stoical, strange and surprising phrases selected and arranged to form a new work that readers have found “poetic,“intriguing”,“fascinating” and even “exciting”. Jo Valentine’s design for this palm-of-the-hand volume features a mosaic of images taken from the original rainfall book, and it is made using a traditional long stitch binding. Each copy, in a limited hand-made edition of 25, comes with a bookmark showing an individual rain gauge reading from the survey: it might be from Miss Usborne at The House, Writtle; from Mrs Story Maskelyne at Basset Down House; from the gauge of Captain Ching, R.N. of Launceston; or from another of the keen individuals and institutions that sent in their records. Note - Rain Instruments has previously been published in a limited electronic edition only. 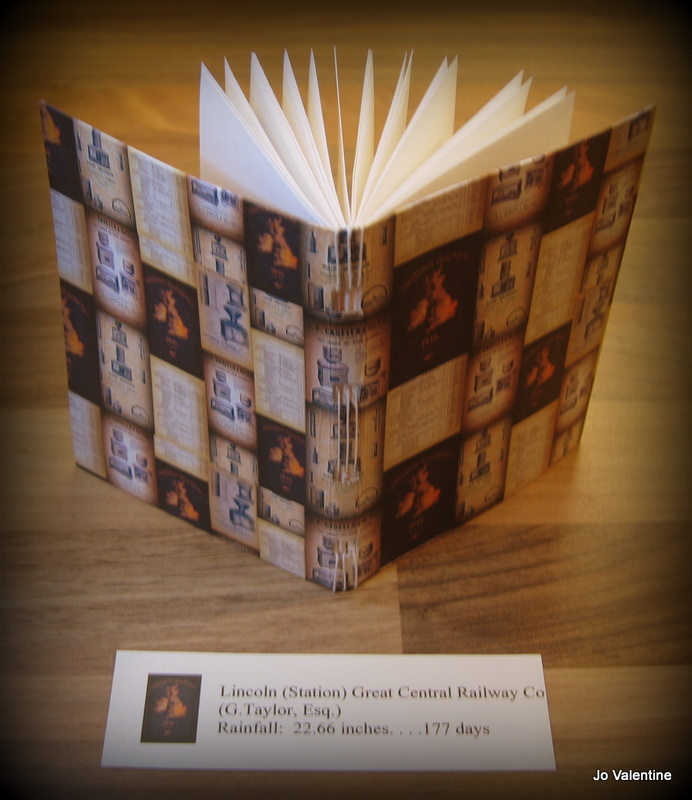 This is the first book publication, slightly revised. Update - all copies have now been taken. A new title will be announced when ready.